Like seasoned drinkers watching tipsy pubescents, GPS sports watches chuckled patronisingly when they first saw the giddy excitement about the first smartwatches and fitness trackers. But then they copied them. Does a serious runner honestly care about an activity tracker that records how many steps they take between their desk and the kettle if they're going to be running 15km later? And as their workout might be the only time they can block out the incessant white noise of email and social media, do they really want notifications on their watch? If you're serious about exercising, you need a GPS sports watch – ideally one with a heart-rate monitor. Garmin and Suunto are the Canon and Nikon of the scene, and both are onto the third iterations of their premium sports watches. How does the young pretender to the throne, Polar's V800, shape up against them? Who, to use Strava speak, is the sports watch King of the Hill? ll of the watches in this test record GPS and heart-rate data with impressive accuracy – nothing does it better. So it's the other features they offer that will be the key weapons in this battle for supremacy. These sports watches will give you at least three bits of information – of your choice – on your screen at a time. That could be your distance, pace (or average pace), speed (or average), ascent, descent, cadence (useful for runners trying to adapt to a more efficient technique), exercise duration, heart rate (or average), calories burned, lap times and even mapping of sorts. All three offer features for swimming, too – stroke count, laps and distance. Meanwhile, key navigation features include barometers, altimeters and compasses. You can import gpx files, while other route-planning functions will strongly appeal to hillwalkers and weekend warriors. If you get lost while GPS is recording, both the Garmin Fenix 3 and the Suunto Ambit3 Sport HR let you retrace your steps. All three sync via Bluetooth to smartphone apps and desktop software, for an absurdly detailed analysis of your training. If you're a runner, cyclist, swimmer or triathlete, both the Polar V800 and the Ambit3 are top training aids. The V800 doesn't do much in the way of navigation tools, but it does offer a raft of workout modes, even strength training and crossfit – though it only records cadence with the addition of a stride sensor. The Ambit3 is targeting the triathlete, recording power on your bike and your heart rate when swimming. The Ambit3's activity tracking, however, is limited to calories, and it doesn't track sleep. 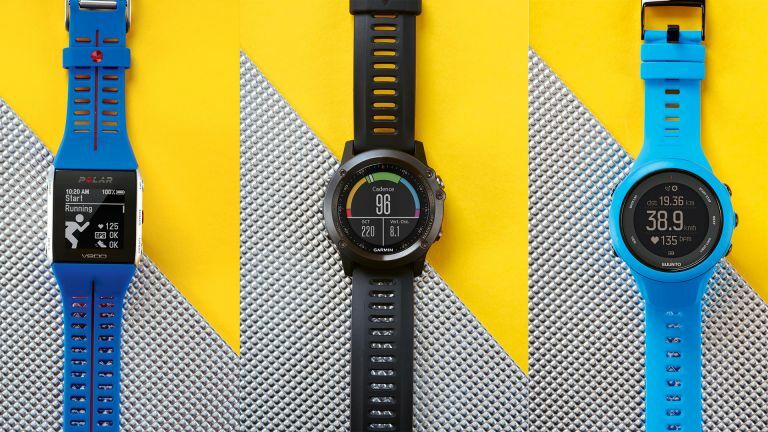 The Fenix pretty much does all that the other two do; there's a triathlon mode that auto-jumps between activities, and it also appeals to the walker, the cross-country skier and the outdoor generalist. It even recognises the key differences between, say, indoor, outdoor and trail running, and pool and open-water swimming. The runner is aided by vertical oscillation and ground-contact time. Via Bluetooth, the Fenix also gives you a weather forecast and more. he conundrum for the watch maker is getting all this clever tech squashed down into something that's comfortable and practical on the wrist. But wait – we also need a watch face large enough to clearly read reams of data when we're running. Oh, and approximately 73 buttons. It'd better look good, too. And by jove, the watches on test here have done it. The Fenix 3, for starters, looks classy. Bond-level classy. Forged with a scratch-protected, domed crystal and stainless steel, it's rugged and feels like it would survive an argument with a tank. Other than at The Anti Watch League meet (if they even could meet, without knowing the time), you can't imagine a situation where it would look out of place. The downside of the Fenix is that it's large and less comfortable on thinner wrists, though it's still surprisingly comfortable for its size. The full-colour, LED-backlit, sunlight-readable screen is the best in class, and data layouts make good advantage of the bigger screen. The Ambit3, in contrast, may divide opinion. The Sport HR is available in some lovely, bright colours that you might not feel comfortable wearing to more sombre occasions. It's plasticky, if good-quality plastic (polyamide), making it feel like more of a plaything. But the upside is the Ambit3 is the most comfortable of the three, thanks partly to the super-soft and malleable silicone strap. All the watches feel big and awkward at first, but this is soon forgotten about – the Ambit3 quicker than the other two. The buttons, however, often need a couple of presses to get a response. Some will naturally remove the Polar V800 at bedtime (which isn't conducive for garnering shut-eye data), but the Ambit3 will most likely stay in place unnoticed. The macho-feeling V800's aluminium and stainless-steel body is square and compact, and it feels it, unfortunately. Appearance-wise, it also doesn't quite have that desirability factor. It's pleasingly simple in design, but just isn't as compelling to look at as its two rivals. o which watch can help improve your sporting performances the most? And what are they all like to use? The V800's sleep data is limited and it does little for running dynamics without an additional stride sensor and foot pod – though these won't be key features for most. Its USB cord for charging and syncing with the Flow Sync desktop software is very fiddly. However, the V800 does boast, among others, a VO2 max test. This determines your body's ability to recruit and utilise oxygen while exercising. It's as good as stipulating the marathon time you're capable of, and until recently required a coach, a treadmill and a lot of breathing into a mask. Orthostatic testing gives a score to your current health condition, Jump looks at explosive strength and anaerobic performance, RR (resting rate) tracks your heart rate – key for detecting over-training. As is the Recovery Advisor: after a workout, the V800 tells you the sensible recovery time till your next workout. The V800 also gives informative feedback after a session: in what way has that workout benefited you? It can tell you, for example, what percentage of calories burned were fat. Other neat touches include an on-screen graph showing how many minutes you've spent in each HR zone. The activity reminders are good, too. Activity tracking really lacks on the Ambit3, and it doesn't have those neat VO2 max tests. But it does everything else well. It'll sure as hell help you on your way to marathon personal bests. Voice guidance for interval sessions is a neat touch, and multi-sport users can switch sport mid-exercise with a few button presses. For the runner, the Fenix 3 has VO2 max (and race-predictor) testing, ground-contact time (longer being hypothetically worse) and vertical oscillation (your 'bounce'). The watch also has recovery-time recommendations, as well as Virtual Pacer (alerts if you're off target pace) and Racer workout. Sleep tracking is very detailed. The announcement of personal records is a feelgood touch – the watch is a great motivator. T3 rates: As well as looking great, Garmin's Fenix 3 just does so many things. It's a de facto activity tracker, smartwatch, GPS watch and outdoorsman's watch, and a rugged and classy gadget to have on your wrist. The colour screen is best in class, and the battery life peerless. T3 slates: It's pricey. Plus vibration alerts whenever your watch and smartphone Bluetooth disconnect or connect again are annoying. T3 says: It's not cheap but you get a serious piece of top tech. Simply the best GPS sports watch there is. T3 rates: It's a comfy and effective, high-tech gadget, with good nav and swim tools. T3 slates: The buttons could be more responsive, and activity tracking is lacking. T3 says: The next best choice for runners and triathletes. T3 rates: It really excels on the coaching side of things, and it has a great app, too. T3 slates: Irritating charger cord, lack of navigation tools, blocky feel and pricey. T3 says: It's bold enough to be different, and is a good choice for the triathlete.